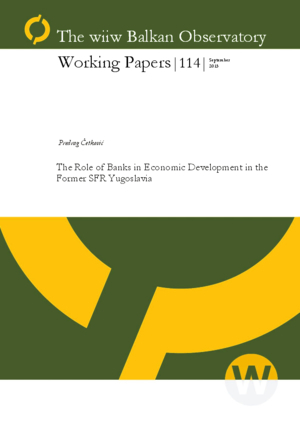 The economic model of the former SFR Yugoslavia was subject to frequent institutional changes which were oriented towards the real economy as well as the banking sector. The country experimented with a wide range of institutions in the ﬁnancial sector which had diﬀerent implications for the autonomy of banks. The industrialization period from the end of the second world war until the end of the 1970s was marked by a sharp expansion of bank credits to enterprises. However, the Yugoslav banks relied strongly on foreign capital inﬂows for funding their credit activities which contributed to the massive increase in foreign debt of Yugoslavia during the 1970s. The dependence of the Yugoslav economy on foreign funds is a feature which is still very much present in the Yugoslav successor countries.